This beautiful 1150 square foot Sunrise condo is nicely furnished and features a queen sized bed in the master, with private bath and two twin beds in the second bedroom, also with private bath. Ocean view of the Pacific. This home sleeps up to four in beds. The large, gourmet kitchen is fully stocked with all utensils, cookware, granite countertops, and wood cabinets. Free Wi-Fi, Local phone calls, Cable TV and 24 hour security included in the rate. Daily maid service available for an additional fee. All linens are provided. Flat Screen in living room and MBR. Central air conditioning and ceiling fans in all rooms. Washer/Dryer in unit. 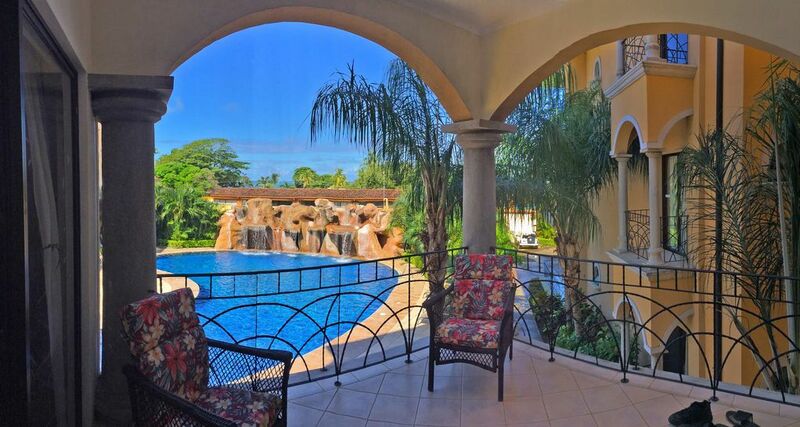 Large, resort style pool with cascading waterfall and plenty of space to relax. Only steps to famous Tamarindo Beach! Let us help you experience the TRUE Costa Rican lifestyle! We are here to help with your tour reservations, fishing charters, rental car reservations and offer private transport to and from the Liberia and San Jose International Airports for an additional fee. Inquire about our Low Season and Last Minute Specials! Blue Water Properties of Costa Rica is a locally owned and operated company that manages fine homes, condos and villas for owners that live abroad. We pride ourselves in 5 star service and strive to make your vacation the best it can possibly be! Our office is located right in Tamarindo and we have been voted "Excellent" on Trip Advisor year after year! Location! Sunrise condos have the best location in town--directly across the street from the beach and right in the heart of town. You can walk to everything so a car is not necessary! Great resort style pool with waterfall. Great 2 BR, 2 BA ocean condo directly across the street from Tamarindo Beach and right in the middle of town! Ocean view! 24 hour security, 1 assigned parking spot, elevator access, private balcony, resort style pool with waterfall feature. Great location and very comfortable! Would definitely come back. This condo is in a wonderful location in Tamarindo. Walking distance to shops and restaurants. Beach access is across the road. We saw monkeys each morning and each evening in the mango trees. We were on a girls trip and had a fabulous time. The area is very safe. We did have a couple minor issues with the condo, but we couldn't have asked for better service with the Blue Water management company. If we hadn't had a couple minor issues we never would have met Fiorella and Marcelo in the Blue Water office. We had such fun conversations with them. Truly wonderful people. They made our girls trip extra memorable. I also highly recommend booking tours with them as well. We did the Palo Verde tour with Junior as our tour guide. We had so many laughs with him. The tour was excellent, but Junior made the tour one of the best we've ever done. We are looking forward to coming back and staying with them again. We enjoyed our stay at Sunrise #38. The apartment was clean and had everything we needed including beach chairs. The Blue Water Properties staff, especially Fio, were very helpful. Our Nature Air flight was canceled at the last minute and Fio arranged a driver for us from San Jose as we didn't want to rent a car. She also arranged a secluded beach tour for us with one day's notice. Our main negative comment has to do with the frequent smell of sewer gas in the condo. Two very strong air fresheners had been placed in the laundry closet to mask the smell, but the "fragrance" of the air fresheners was toxic to some of us so we wrapped them in several plastic bags during our stay. Also, the only way to get a cross breeze in the condo was to open the front door, but you lose your privacy if you do that. We've found this a common problem in condos in warm climates in other places as well, so it's not unique to this property. The sewer gas smell is something we've encountered in other countries, such as Mexico, so unfortunately, this is not unique to Tamarindo. Great vacation Across From the Beach! We returned to Tamarindo and stayed in this beautiful 2 Br/ 2 Bath condo with everything we needed. It was well stocked and working WiFi throughout, with Cable TV, washer, dryer, dishwasher and beach chairs. The view of the ocean and pool were relaxing! The pool and the grounds were well kept. The town is active during the day, but quiet at night. Everything is in walking distance. We used a shuttle service from the Liberia airport and did not need a car. The beach is amazing and there are many grocery stores and wonderful restaurants. We had no problem with the elevator. Blue Water Properties were very helpful and responsive. I highly recommend Unit 38 and Sunrise! We just returned from a wonderful week in Tamarindo. We were very pleased with the complex and the unit. We have stayed in other complexes in the past, but found this to be the best place in Tamarindo, especially for the price. We prefer to spend money on day trips and excursions than a fancier condo. It is steps away from the beach and not crowded. The pool area and grounds were clean and well maintained. Our apartment was luxurious, updated & clean, and included everything we needed: Wi-Fi, grill, beach chairs, washer/dryer, flat screen TV's, and all appliances. We slept with the windows open to listen to the waves. The view of the pool and ocean were wonderful! We highly recommend Sunrise and plan to return. Hi Richard! Thanks for your kind review. We are glad you enjoyed your time at Sunrise 38 and hope to have you all back in the future! all the best from the team at Blue Water Properties of Costa Rica! We spent 10 wonderful days in Tamarindo for our honeymoon. The location was perfect! Sunrise is very close to beach, restaurants, and shops. We stayed in unit #38, which was clean, comfortable and had everything we needed for a great vacation. It even had beach chairs, towels, and a grill for us to use! The view of the pool and the ocean were spectacular. The pool and the grounds were beautiful and well maintained. We loved the beach, especially at sunset. We’ve already recommended this condo at Sunrise to our friends and look forward to returning!